It's always fun to eat out. However, what makes it even more fun is when you eat out with like-minded individuals who share the same amount of love for food and eating as you do. Take my friend D for example. We have known each other back in Manila as he used to do weekly baking classes and I was one of those who has been intending to attend but sadly, I never really got the chance to. Still, D would religiously send me his schedules every single Monday. It actually came to a point when no Monday is complete without receiving D's (or at least, his secretary's) sms. Cut to last year, I received an email from D telling me that he's also based here in Singapore and he would like to meet up. Finally, after several emails back and forth, we met for the first time over yummy Japanese dinner and dessert after. It was really nice to meet a fellow Pinoy foodie in a foreign land. To date, D, Paul and I have been frequent foodie buddies as we have tried a couple of restaurants and cafes around town. The most recent one was when our friends Pong and Tippy of the famous Googly Gooeys came to Singapore to conduct a weekend workshop. I wasted no time in inviting them out for dinner on their first night in the Lion City. 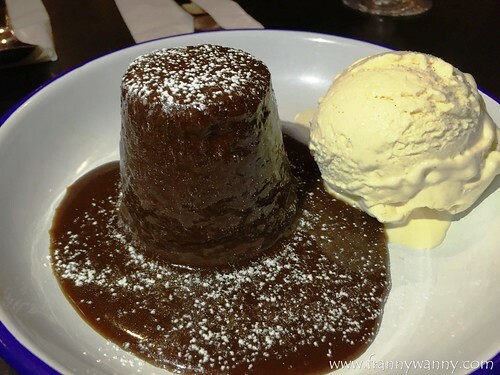 As I've been on the look out for the best Sticky Date Toffee Pudding in the country, D suggested that we go dine at The Lokal. I've been there before but it was for a quick brunch meet-up. Sadly though, I wasn't too pleased with my order as it was a DIY brunch set. Anyway, we're back at The Lokal for dinner and I was really excited about it. The Lokal has a very simple and short menu consisting of 4 starters, 6 mains, 2 sides and 2 desserts. The best way is to order a much as you can and just share with the group. That way, you can have a taste of all the dishes. Clever, huh? 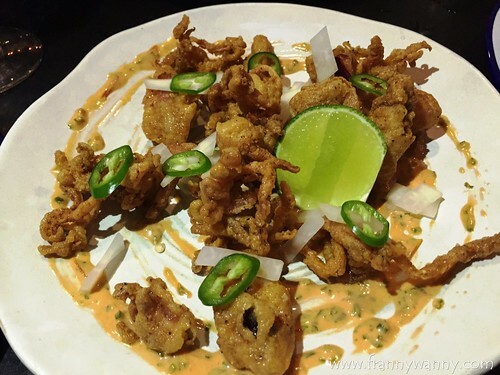 Deep-Fried Baby Squid (S$14) served with pickled papaya and chili-coriander mayonnaise. I have to admit that I was the one who requested for this. Sadly, it wasn't as amazing as I imagine it to be. The squid was a bit tough and dry while the sauce barely made an impact. 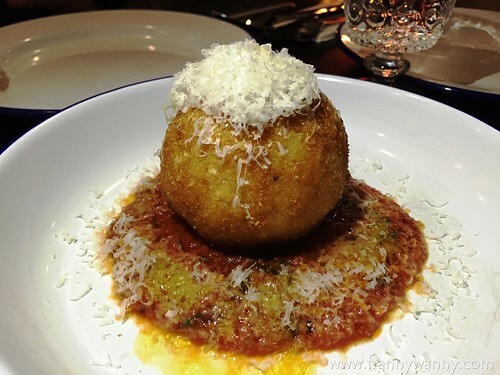 Arancini (S$13) -- deep fried risotto ball with mozzarella, parmesan and tomato sauce. I was so surprised that one order was just one huge ball. Just imagine how 6 of us were able to share this one. For the price, I was expecting at least 3. Don't say I didn't warn ya! 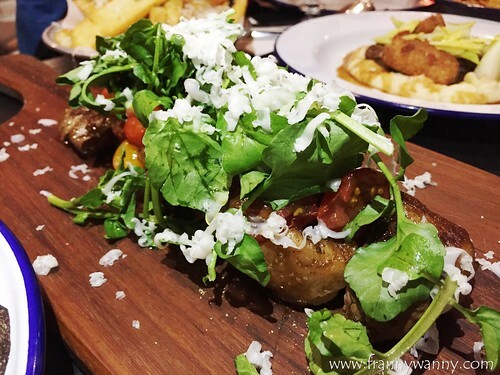 Now this is one thing you shouldn't miss at The Lokal. 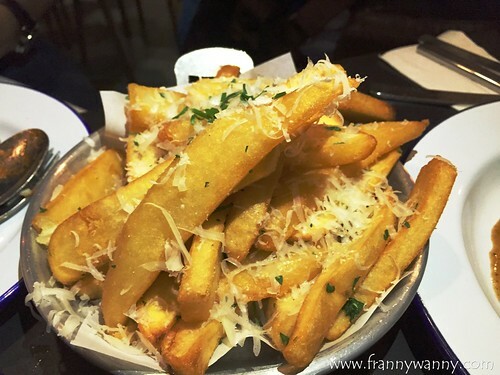 It's a good way to start your meal with a basket of thick-cut fries and you'll love the strong aroma of the truffle oil. We munched on this while waiting for the rest of our orders and I have to say that the whole platter was wiped out within minutes! I initially thought tagliata was also a kind of pasta (hello, Tagliatelle!). Apparently, it's a thick slice of beef served cherry tomatoes, watercress and asiago cheese. If you love steak or beef, then this is one thing you have to order. I love how perfectly seared the steak was and it was sprinkled with a bit of salt where you can taste that salty kick here and there. 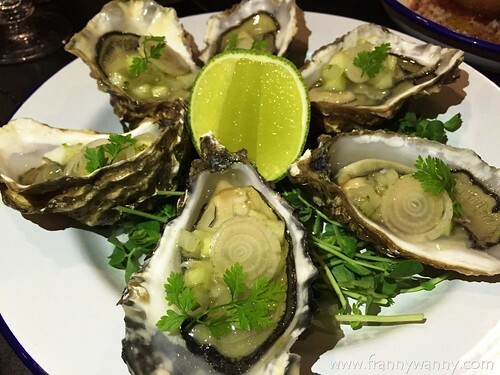 Of course, have it with watercress for a balance meal. 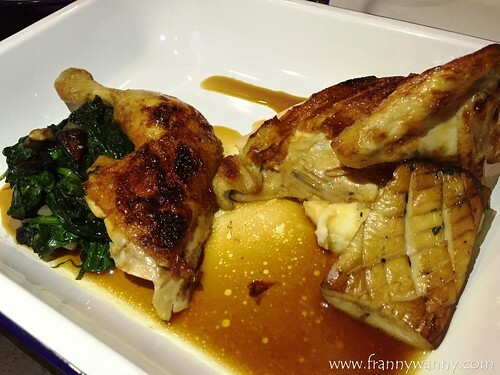 A simple, straightforward dish of chopped roasted chicken with the yummiest accompaniments -- mushroom, spinach and *wait for it...wait for it...* truffled mashed potato! The chicken was so tender that got us ooh-ing and aahh-ing in every bite. Served with pappardelle noodles and parmesan cheese! This is a more sophisticated version of the world famous bolognese pasta. 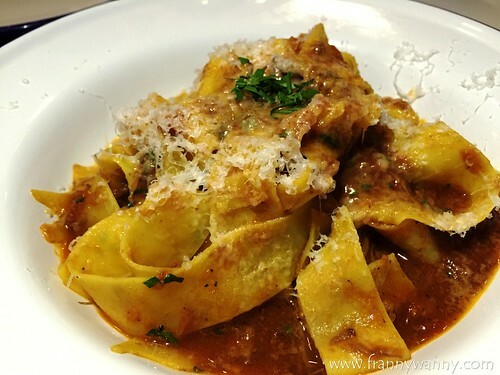 This is a really good comfort dish as you'll love the thick pappardelle noodles and the chunky beef. 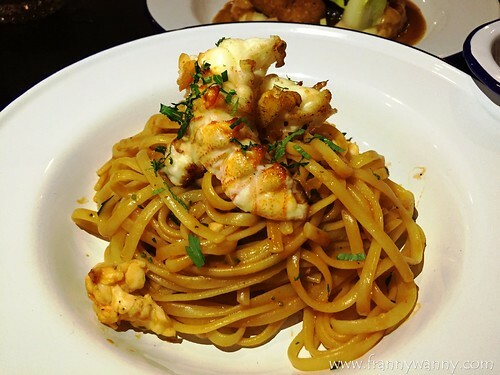 My top pick of the night was this creamy pasta dish of slipper lobster meat and al dente linguine noodles. 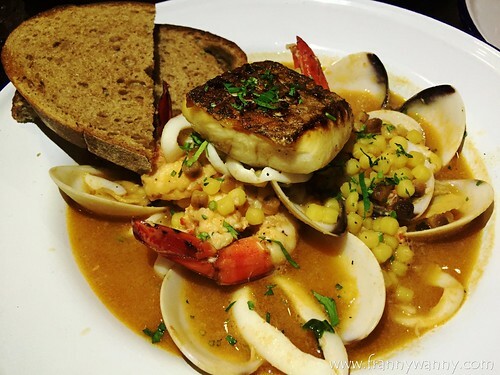 I love love love the consistency of the tomato-shellfish sauce and how simple this dish is but it packs in so much flavor and flair! Among all the dishes that we've ordered that evening, this is the one that I'd happily order again and again. Just a-okay, lah :) I found the shrimps a bit overcooked and the fregola failed to create a good impact. This is a very interesting dish that we all agreed to give it a try. 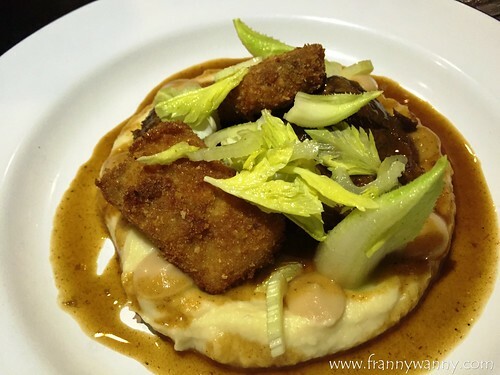 As expected it was pretty good and I liked the accompaniment of sweet apple sauce and creamy celeriac puree too. Can you just imagine the food coma that we all have experienced that evening? That was 4 starters and 6 mains! However,we're not yet done! D made sure that we have a sweet ending to our delicious dinner so we went for the two dessert items in the menu. Be still my heart ♥ It was love at first bite! Remember how much I love sticky date puddings and true enough, The Lokal has one of the best in town. I have yet to try more but so far this is definitely #1 in my books right now. 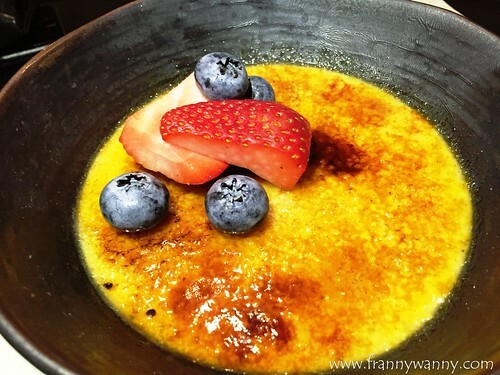 I love creme brulee too but I have to admit that this paled in comparison to the amazing sticky date pudding. If you love creamy and caramel-y desserts though, then go for it! You'll enjoy the fresh berries on top as well. There you have it! Leaving out only 5 items on the menu, we enjoyed every single dish that came our way and the best thing is, all plates were wiped clean at the end of the meal. We all deserve a good pat at the back, if I must say so myself. 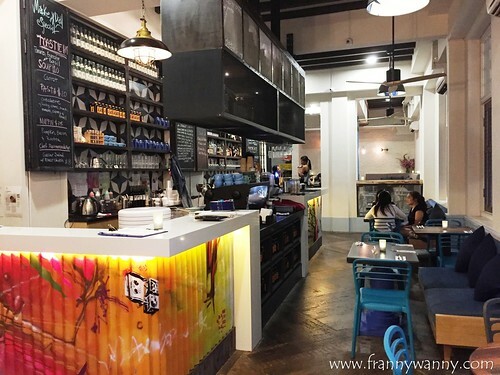 Check out The Lokal at 136 Neil Road in Tanjong Pagar. They're open everyday and they serve brunch too! Call them at 6423-9918.